In order to grow & get a little handle on what’s trendy in the art licensing/surface/textile fields, I signed up for MATS Bootcamp with Lilla Rogers (a renowned art licensing agent and arts instructor). The class has just begun, so far we have our first “mini”. 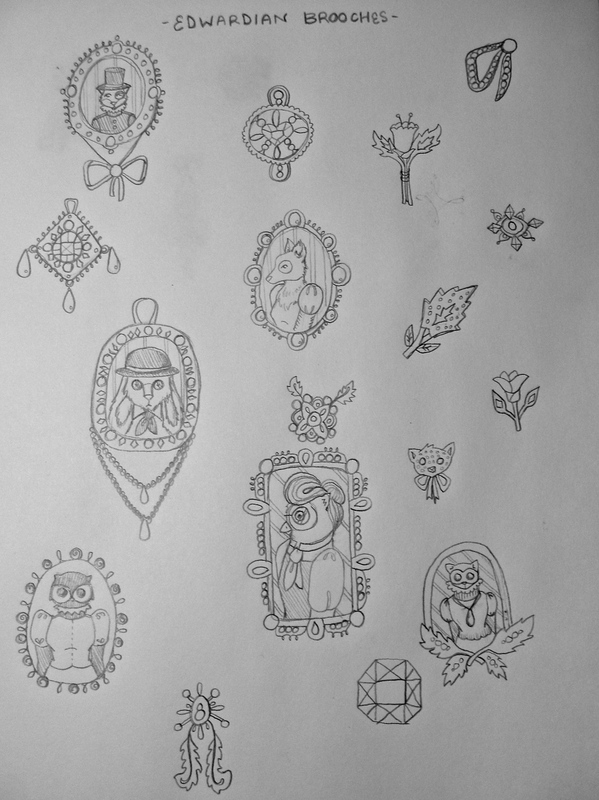 The prompt was “Edwardian Brooches”, so I have been doing a lot of doodling! We will get a larger prompt in the 4th week of class that is thematically linked, so I’m pretty curious to know where we’re going with it. In researching brooches, I was inspired most by the portrait images. Fancy ladies in puff sleeves and high collars, men in monocles and bowlers (ok, maybe I’m adding the monocles, but I usually feel they’re a nice touch). Here’s my first round of sketches, I’ll keep you updated on my progress! Monocles are ALWAYS a good idea. I really love the bird-lady. 7s9dela4 on New Project: Chalk-A-Day!